We’d love your help. Let us know what’s wrong with this preview of Convergence by Ginny L. Yttrup. Psychology professor Dr. Denilyn Rossi contends that the past is either a shadow that haunts us or a force that propels us. The choice is ours, she tells her students. What she doesn’t tell them is that her own past is a shadow she can’t seem to shake. Fear has immobilized he A psychologist paralyzed by fear. To ask other readers questions about Convergence, please sign up. Convergence deals with three timelines intermixed throughout the story. Dr. Denilyn Rossi, a psychologist and later a psychology professor, has dealt with a stalker in the past and is dealing with a stalker now. Her first experience with a stalker destroyed her marriage to Keith, but at the same time gave her a feeling of empowerment that she survived the situation and that the stalker was in prison. But now, eight years later, she is consumed by self doubt, anxiety attacks, and the inability to Convergence deals with three timelines intermixed throughout the story. Dr. Denilyn Rossi, a psychologist and later a psychology professor, has dealt with a stalker in the past and is dealing with a stalker now. Her first experience with a stalker destroyed her marriage to Keith, but at the same time gave her a feeling of empowerment that she survived the situation and that the stalker was in prison. But now, eight years later, she is consumed by self doubt, anxiety attacks, and the inability to perform her job, knowing she is dealing with a stalker again. Constant fear is no way to live and Denilyn decides to do something to end the stalker threat forever. I have trouble enjoying books that withhold so much from the reader that the protagonist knows. Both Denilyn, in her timelines and Adelia, in her timeline, often refer to what has happened in the past without us getting to know what has happened. The withholding of information from the reader, about big events of the past, while the characters talk all around the specific events without revealing what happened, is frustrating to me. But about a third of the way through the book I just let that go, especially because I started to have ideas about what had happened. For me the book actually got better once I had more information about the past because I began to care more then about what might happen in the future. The author did an excellent job of making me feel the dread and fear of the stalker being right around the corner with no where to hide. I can usually stand back and read about what is happening to characters, without feeling scared myself, but there is a garage scene that really made me feel like things were "real". At the same time, the main character does some really unwise things when she is aware that someone is stalking her and threatening to kill her and those close to her and this was before she tries to take control of the future events. This isn't my first Ginny L Yttrup novel but it's her first suspense novel. She absolutely nailed the genre. I really couldn't ask for anything more from a suspense novel. The main character is likable, the actions are believable and the tension couldn't have been any higher. I especially loved the way the author revealed details by going between prior years and current day events. There were spectacular plot twists that had me going back to re-read passages with the thought of "did that just ha This isn't my first Ginny L Yttrup novel but it's her first suspense novel. She absolutely nailed the genre. I really couldn't ask for anything more from a suspense novel. The main character is likable, the actions are believable and the tension couldn't have been any higher. I especially loved the way the author revealed details by going between prior years and current day events. There were spectacular plot twists that had me going back to re-read passages with the thought of "did that just happen?!!". Excellent suspense novel. Wow. I was completely floored by this book. This is one of the most complex stories I've read in a long time. Dr. Denilyn Rossi is a psychology professor - but she still deals with debilitating fear and PTSD over events that happened over 8 years ago. This character is so incredibly multi-faceted, it takes the length of the entire book to unravel all her complexities. And there are loads of plot twists along the way. Despite how intricate her character was, I was still able to relate and empathi Wow. I was completely floored by this book. This is one of the most complex stories I've read in a long time. Dr. Denilyn Rossi is a psychology professor - but she still deals with debilitating fear and PTSD over events that happened over 8 years ago. This character is so incredibly multi-faceted, it takes the length of the entire book to unravel all her complexities. And there are loads of plot twists along the way. Despite how intricate her character was, I was still able to relate and empathize with her on many levels throughout the book. The plot. Wow, I don't even know where to start, or what I can say without giving too much away. However you think this story is going to go, you're probably wrong. There will be a multitude of twists and turns before you reach the end, and the suspense keeps you turning pages. I have not read one of Yttrup's previous books, but I greatly enjoyed her writing style and will definitely be checking out more of her work. The themes of fear and faith she weaves throughout this story were masterfully done, touched my heart in so many ways, and really make the reader think. Overall, Yttrup pens a complex and unique novel of suspense and faith and knocks it out of the ballpark. I highly recommend this book! Intriguing, fast-paced, thrilling and crazy plot twists, is what this first suspense novel from Ginny L. Yttrup produced. Suspense is my favourite genre, and with favourite authors like Lynette Eason, Terri Blackstock, Irene Hannon and Dani Pettrey I have quite high expectation when I give a new suspense author a try. Ginny met every expectation with this book. I found myself reading late in the evening/early morning hours to see what is going to happen and found myself a few times surprised with some excellent unexpected plot twists. So why not full 5 stars - for me, the whole book felt like it was building up towards an ending that would be full of action and revelations. I guessed early on who the villain is, so I was waiting for the face to face at the end. It did come, but it felt a bit rushed. I would have liked a bit more revelation from the villain wrt why he did what he did and especially a better declaration wrt the accident so many years ago. I loved the theme of overcoming your fears and truly letting go and trust in God's protection. I also love how Jay en Deni were honest with each other when they discussed their feelings and how they helped each other to work through what the experience. Fans of Christian suspense should definitely pick up this book. It's disappointing for me to say I didn't connect with this story at all, however, after a few chapters I was intrigued by Deni's situation and wanted to know how it played out. "I turn away from the mirror and don't look back. I throw the paper towel into the trash, then dig through my backpack, pull out a tube of sunscreen, reapply it, and toss it back into the pack. I check the time on my phone. This is my last stop before Three Rivers. Am I ready? Yes. I've done everything necessary, except f It's disappointing for me to say I didn't connect with this story at all, however, after a few chapters I was intrigued by Deni's situation and wanted to know how it played out. "I turn away from the mirror and don't look back. I throw the paper towel into the trash, then dig through my backpack, pull out a tube of sunscreen, reapply it, and toss it back into the pack. I check the time on my phone. This is my last stop before Three Rivers. Am I ready? Yes. I've done everything necessary, except for one thing. It's the reason I stopped here." There's no action going on, it's almost like a diary describing Deni's day and her life as a professor with flashbacks explaining her trauma and fear levels as she tries to cope and move forward. The story just felt too fragmented to me, like puzzles pieces slowly being put together. It didn't grab my attention. I easily suspected Keith, the husband, and Willow, the student. To me, Keith was either abusive or guilty. My fave characters were Jaylan, the best friend, Deni's mom and Sonia the Detective. There's no violence in the story (someone gets hit by a baseball bat and there's an accident while skydiving...there's a confrontation with the bad guy at the end, but none of these are graphic or suspenseful). A character is killed off scene in a flashback but nothing is described and the scenario becomes more tragic than anything else. The writing hides A LOT from the reader or feels misleading. I just couldn't stand Keith and Denilyn is such a great character but her ways of coping and trying to heal are more told than experienced. There was a VERY important detail left out until the end of the story and I just couldn't believe it wasn't revealed early on, felt like the narration was poking fun at the reader. There was a SLIGHT hinting towards this reveal but I totally missed it wondering what would happen next to Denilyn. When everything gets explained, it felt like the story was messing with my mind instead of trying to help me enjoy a suspenseful story played out with justice. I totally disagreed with Denilyn's tactics to flush the bad guy out, also felt tricked by that. Her personality completely changed and it just didn't feel practical or authentic to me. This book wasn't for me, but I hope it helps and entertains others who need encouragement in a story like this one. Also the cover is good, but to me it doesn't match Denilyn's appearance. Excuse me if this review doesn't make any sense -- I'm still reeling with aftershocks -- the post-read-I-can't-believe-I-survived-right-through-to-the-jittery-end kind. My brain is rattled, my tummy in knots and my heart is in permanent need of a defibrillator after reading Convergence (brilliant title, by the way -- crazy brilliant!) Phew! So...this story...let's just say I was bemused and confused right from the start and stayed in that state for a good part of the read. Be prepared to feel lik Excuse me if this review doesn't make any sense -- I'm still reeling with aftershocks -- the post-read-I-can't-believe-I-survived-right-through-to-the-jittery-end kind. My brain is rattled, my tummy in knots and my heart is in permanent need of a defibrillator after reading Convergence (brilliant title, by the way -- crazy brilliant!) Phew! Dr. Denilyn Rossi wrote a book on bullying. Then she picked up a stalker. Years later Deni once again is feeling out of control. She feels eyes watching her all of the time. How can it be her stalker? He hasn't been released from jail yet, or has he? Once again Deni's life is in danger. How can this be happening to her again? This is author Ginny Yttrup's first suspense book and I have to say I was hooked from the very beginning! It did take me a bit to get used to the flow of the book. There are Dr. Denilyn Rossi wrote a book on bullying. Then she picked up a stalker. Years later Deni once again is feeling out of control. She feels eyes watching her all of the time. How can it be her stalker? He hasn't been released from jail yet, or has he? Once again Deni's life is in danger. How can this be happening to her again? The suspense was top notch and I really enjoyed the characters. The story has a lot of twists and you possibly you might figure out who the bad guy is. But I think there were some other surprises in the last part of the book that added a lot to this novel. There is a lot of jumping around to different story lines but I thought it was really well done and I wasn't confused by it. I now need to read more from Yttrup because all of her books that I have read have been amazing. Wow! This book will certainly be making my top reads for 2019 list! Incredible! With just the right blend of predictability mixed with the totally unexpected, Convergence is a page-turner you won't be able to put down! Deni is a psychologist who deals with crippling fear and panic attacks following a traumatic event in her past. I will allow you to find out the details yourself when you read, but in the story Deni has to deal with analyzing if the fear she is experiencing is her PTSD acting up, o Wow! This book will certainly be making my top reads for 2019 list! Incredible! With just the right blend of predictability mixed with the totally unexpected, Convergence is a page-turner you won't be able to put down! Deni is a psychologist who deals with crippling fear and panic attacks following a traumatic event in her past. I will allow you to find out the details yourself when you read, but in the story Deni has to deal with analyzing if the fear she is experiencing is her PTSD acting up, or if she has truly found herself in danger again. Unfortunately when she faced her initial trauma, she didn't have the emotional or physical support she should have had. Instead, her fears including actual threats were dismissed which lead to a whole new gamut of emotional turmoil. Now years later, she has an even larger hurtle to determine if should trust her instincts or not. Several years ago when I was in high school I dealt with a guy who started to stalk me. It started out when I met him in the hallway one day and said hello to him while walking to my class. I had seen him before but didn't know who he was. I was just being polite. Immediately after that he started showing up almost everywhere including my work. He would hug me for too long as if I was his girlfriend. I wouldn't hug him back but I wouldn't fight him because I was afraid to make a scene. He would show up at my lunch table with my friends and have his hands on me. Multiple times he would show up with his hand in a bandage and say it was because he lost his cool and either punched a locker or wall or whatever happened to be in front of him. One day I saw the evidence of him punching a hole through a wall. So needless to say, I was afraid of him. I told my friends I didn't want him near me and he scared me, but he acted really sly and they thought he was just nice. They even laughed about it and said they thought he was cool. I won't share any more details, but I will say that eventually they saw his true colors too and I was able to get him to leave me alone. I share this because this story really brought me back to that (So yes, this story CAN be a strong PTSD trigger). I wanted him to leave me alone but the people I thought would support me thought I was being unreasonable. It made me question myself if I was over-reacting or if he was a real threat. These are the types of thoughts that ran through Deni's mind, as her husband--the person who was supposed to be her biggest supporter and protector-- dismissed her fears and was absent when she needed him most. Sometimes the wounds from those we love are actually the ones that scar us the most. This story is full of twists and turns and is sure to keep your mind racing. This is my first time reading a book by Ginny Yttrup, but from what I've read this is her first book in the Christian suspense/thriller genre and I never would have guessed. She writes like a truly seasoned suspense pro! This story had me on the edge of my seat and I highly recommend as a must-read! Convergence absolutely rendered me speechless at the perplexing, electrifying conclusion except to say, "What just happened here!?" I even had to go back and re-read several of the chapters devoted to a specific heroine to fully "get" it! I felt as twisted as a pretzel as the author took me on a suspense-filled roller-coaster of a ride unlike any other. Deni has major issues with fear for good reason. Years after being attacked by a stalker she has begun to have panic attacks, flashbacks, and st Convergence absolutely rendered me speechless at the perplexing, electrifying conclusion except to say, "What just happened here!?" I even had to go back and re-read several of the chapters devoted to a specific heroine to fully "get" it! I felt as twisted as a pretzel as the author took me on a suspense-filled roller-coaster of a ride unlike any other. Deni has major issues with fear for good reason. Years after being attacked by a stalker she has begun to have panic attacks, flashbacks, and strange vibes that someone is once again watching her...following her. I SO admired her character—fearless, but terrified at the same time. Oxymorons, I know, but using faith as her shield she fights to empower herself over her fears. With the exception of her empathetic husband, she has a support group of great friends that I became attached to as well. Very impressed by Yttrup's first attempt at suspense writing, I highly recommend this exhilarating, original page-turner! Convergence is an intelligent, psychological thriller that digs deep into Deni's (the heroine) fears. You’re afraid right along with her, while second-guessing what is real and what is not. The read, as turbulent a ride as a raft being tossed over white-water rapids, keeps you flipping the pages and keeps you wondering who the stalker is from page one to the final chapters. Yttrup excels at misdirection, and the plot has many I-didn’t-see-that-coming moments. Yttrup gives readers a flawed character driven psychological thriller. Deni was attacked ten years ago and feels she is being stalked today. We don't find the details of the past attack until well into the book. Much of the text consists of Deni's thinking. I had difficulty with the plot structure of this book. The narrative flips back and forth between three different time periods and I felt that produced a disjointed plot. Another issue I had was the withholding of information. The narrative is Yttrup gives readers a flawed character driven psychological thriller. Deni was attacked ten years ago and feels she is being stalked today. We don't find the details of the past attack until well into the book. Much of the text consists of Deni's thinking. I had difficulty with the plot structure of this book. The narrative flips back and forth between three different time periods and I felt that produced a disjointed plot. Another issue I had was the withholding of information. The narrative is written in the first person with long passages of Deni's thoughts. I was dismayed that at three quarters of the way through the book, we find out something about Deni that is an essential part of her life and who she is and what is happening to her. As a reader, I felt blindsided. Yttrup purposely let us think we were part of Deni's life when we were really being fooled. There is another plot technique Yttrup used that really irritates me. At the end of a suspenseful scene, all looks lost and all goes black for Deni. At the beginning of the next chapter, all is well, Deni has somehow miraculously survived the black and is alive and well. One other issue is that we are left hanging at the end of the novel with respect to one character, the one who attacked Deni years ago. He is active in the plot up to nearly the end then just disappears without his participation being resolved. Readers who like a novel heavy on psychological suspense, mostly experienced through Deni's thoughts, may like this one. This is the first book I’ve read by this author and it’s her first suspense book. I think it was definitely a good move on her part and mine. The story was interesting. Deni is a psychology professor who tells others dealing with bullying situations that “The past is either a shadow that haunts us or a force that propels us” (location 506). Yet she isn’t able to put her own counsel into practice very well. It’s a little eerie watching her as she wonders if she’s losing her mind. The story moves This is the first book I’ve read by this author and it’s her first suspense book. I think it was definitely a good move on her part and mine. The story was interesting. Deni is a psychology professor who tells others dealing with bullying situations that “The past is either a shadow that haunts us or a force that propels us” (location 506). Yet she isn’t able to put her own counsel into practice very well. It’s a little eerie watching her as she wonders if she’s losing her mind. The story moves from past to present and back frequently and between three women’s lives. It can be a little confusing at first but things become clearer as they converge. I wish there had been a little more on Willow. The author uses a lot of vivid imagery. “Like a child hiding in the folds of her mother’s skirt, the morning sun shrinks behind dark, billowing clouds, seeming to have forgotten its own power” (location 94). I enjoyed it but it sometimes felt a little too much for me. This was an enjoyable suspense book. There was plenty of action along with a twist or two. It showed how fear really can keep you a prisoner and that there is hope to break the cycle of fear. Deni had some good friends to support her and help her and it showed how necessary that is for us too….to have some people who know us well who are there for us when times are hard. Thank you to Shiloh Run Press and Netgalley for providing me with a complimentary e-copy of this book. All opinions are my own. Convergence by Ginny L Yttrup is a thrilling, edge of your seat suspense novel. It dives deep into the plot twists that revolve around the lives of two different women. Before their lives converge, it can be a little confusing trying to keep track of the women and what is going on in their lives. Flipping between the past and present, and between Denilyn and Adelia's perspectives author Ginny L. Yyttup manages to build surprises into the plot that I really like! I felt for Denilyn - the trauma s Convergence by Ginny L Yttrup is a thrilling, edge of your seat suspense novel. It dives deep into the plot twists that revolve around the lives of two different women. Before their lives converge, it can be a little confusing trying to keep track of the women and what is going on in their lives. Flipping between the past and present, and between Denilyn and Adelia's perspectives author Ginny L. Yyttup manages to build surprises into the plot that I really like! I felt for Denilyn - the trauma she had experienced in the past and the fear that she was either being stalked again or her PTSD was making her think she was. I could relate to both the main characters, their stories, and their choices. I like the fact that this a clean mystery/suspense thriller and that there are Christian references. I would certainly recommend this book as it is well written, with vivid imagery, and great first person narrative. I love the way I got caught up in the story and thought I knew what was going to happen...only to be proven wrong!! I love the depth of Ginny’s books. Now, added to the depth is page turning suspense. Great read. Great ride. I was intrigued to request an advance review copy of this suspense novel after reading the book’s description about a psychology professor who is overwhelmed by fear and anxiety after her experience with a stalker. One of the strengths of the book is definitely the inner journey of the protagonists in confronting their fears. The book skips around between different characters and points in time so it can be a little confusing to the reader but was still engaging enough for me to persist with the I was intrigued to request an advance review copy of this suspense novel after reading the book’s description about a psychology professor who is overwhelmed by fear and anxiety after her experience with a stalker. One of the strengths of the book is definitely the inner journey of the protagonists in confronting their fears. The book skips around between different characters and points in time so it can be a little confusing to the reader but was still engaging enough for me to persist with the plot. I found out later that this was a first time attempt at a suspense novel by a popular author of Christian books. I am a fan of suspense novels but I don’t normally read the Christian genre. The author did a good job of balancing the two genres, especially for a first attempt. Parts of the plot were a little bit clumsy and drawn out, but the characters were well-drawn and the settings at college and white-water rafting rounded out the story well. I would be interested in reading another suspense book by this author and my would recommend to my Christian friends who are looking for more variety in their reading material. "The past is either a shadow that haunts us or a force that propels us." "It is only faith, belief in what cannot be fully known or understood, that truly saves." 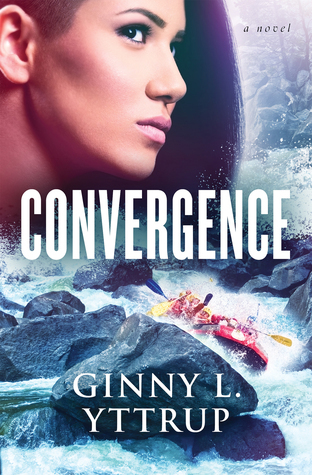 Convergence, a suspense/thriller novel from Ginny L. Yttrup, is a highly enjoyable read that will at some moments keep you on the edge of your seat while other moments have you scratching your head, unsure of where this book will converge to its final conclusion. Yttrup, a first time author for me, provides many thought-provoking pieces of prose that she weaves into this psychological thriller. Denilyn is a likable character, scars and flaws included, that the reader should be rooting for all of the way. There are confusing shifts in timeline and characters that do take some time getting used to and Yttrup does do a great job of merging these together. There were times I was blown away, times I had to keep reading to see what happened next, which is what you look for in these types of suspense books. I loved all the many references to faith, facing your fear through the help of God, and trusting in God to get you through tough situations. Yttrup provides some red herrings and many, many situations where she only gives you a small amount of information to work with to keep you intrigued, though possibly confused. But all in all, this is a solid suspense book with a lot to like about it. I would definitely recommend it because I did find it both unique and compelling and the writing was really good. I saw in the acknowledgments that she thanked Brandilyn Collins and I can see that fans of hers would like this book. *I received this book free from Netgalley and publisher Barbour in exchange for an honest review. Ginny Yttrup has penned a new genre for her in this suspense/psychological thriller. With a spiritual undertone, Yttrup combines incidents from the past and present to create a roller coaster ride from start to finish. Danilyn Rossi is a psychologist, college professor and successful published author. She has recovered from a horrible stalking situation that almost ended with her dead. But the perpetrator is in prison, and now it is time to move on with her life. She is a Christian, but is still Ginny Yttrup has penned a new genre for her in this suspense/psychological thriller. With a spiritual undertone, Yttrup combines incidents from the past and present to create a roller coaster ride from start to finish. Danilyn Rossi is a psychologist, college professor and successful published author. She has recovered from a horrible stalking situation that almost ended with her dead. But the perpetrator is in prison, and now it is time to move on with her life. She is a Christian, but is still questioning why God put her through this difficult time. When, once again, she feels as though she is being stalked, it brings back the PTSD she suffered from after the first incident. Is she going crazy or is history repeating itself? When 3 women's lives converge, one dead, one being stalked, and a leery college student, the answer at last comes to light. A psychological thriller that definitely focuses on the mind games that stalkers can employ to make one question their sanity and their peace of mind. "I don't think trust is a feeling. I believe it is a choice. And on those days when doubt plagues me, I ask for His (God) help to believe what I can't see. That's faith, believing what we can't see. And in this world, we can't always see goodness." A very good start in a new genre for Ginny L. Yttrup. **I received a complimentary copy of this book from Shiloh Run Press through NetGalley. Opinions are mine alone. I was not compensated for this review. I received a complimentary advance copy of this book from Barbour Publishing and was under no obligation to post a review. That being said, Yttrup's foray into suspense is a jigsaw puzzle that keeps you engrossed to the end. Inspired by a tragedy that occurred in her neighborhood, Convergence touches on bullying, stalking, PTSD and faith. Definitely read this if you enjoy her other work. Fasten your seatbelts. Convergence is a fantastic suspense. I throughly enjoyed this book. Suspense fans will not be disappointed. I received an arc from Netgalley and this is my unbiased review. “Convergence” by Ginny Yttrup was a great read! I have to admit, though, I had a hard time getting into this book, but once I got further in, I was hooked! I couldn’t wait to see how the story ended and what really was going on with Denilyn, the main character. Denilyn Rossi is a psychology professor who is trying to deal with her past. She is trying to put everything behind her and get on with life, as she tells her students. However, that is easier said than done! Adelia Sanchez is ready to con “Convergence” by Ginny Yttrup was a great read! I have to admit, though, I had a hard time getting into this book, but once I got further in, I was hooked! I couldn’t wait to see how the story ended and what really was going on with Denilyn, the main character. Denilyn Rossi is a psychology professor who is trying to deal with her past. She is trying to put everything behind her and get on with life, as she tells her students. However, that is easier said than done! Adelia Sanchez is ready to confront her past and get on with life. Both of their lives converge, eventually. This book had a couple of great twists that I really didn’t see coming. This was the first book I read by Ginny Yttrup, and I thoroughly enjoyed it. I look forward to reading more books by her. I definitely recommend this book if you enjoy good, clean, suspense novels. This is a very well written christian suspense novel that will keep you turning the pages. It is one of those rare books that you don't want to end, but you just have to know whats going to happen next. I'm not good at writing what I want to say about a book, so I'll just say you won't regret getting this book. Thank you Barbour Publishing, Shiloh Run Press via NetGalley for the ARC of this awesome book! This is my honest opinion and I highly recommend this book. Romantic Suspense is one of my go-to genres. I love reading a good mystery and getting lost in the chase and the high tension. I know that Ginny L. Yttrup has written for Love Inspired Suspense, so I figured this would be a safe bet when it comes to reading a suspense novel. The suspense is definitely there, but it is a lot of psychological warfare in Delia's head. She has been attacked seven years ago, and the readers are lead to believe it is happening again. The stalker in the shadow issue was handled well and hiked up the tension like I expected. But . . . the two points of view from Adelia and Delia were a little confusing to follow, especially when Delia had two different time frames- 2010 and 2017. Both of the sections were written in first person and Yttrup does include the time and person's name before each switch, but sometimes I had a hard time figuring out the difference. As for the identity of the bad guy, I had a huge suspicion early on who the bad guy was because of the way he came across in the novel, and Yttrup kept throwing more clues toward him to prove me right. Overall, the concept was pretty interesting and definitely something had hadn't seen before, and the tension was realistic and had me lurking around the corner behind Delia, knowing something was about to happen. But the point of view shifts really threw me for a loop and had me doubting if I really understood the novel. I think fans of Elizabeth Goddard and Dee Henderson might enjoy the novel. I received a complimentary copy of Convergence by Ginny L. Yttrup from Barbour Publishing, but the opinions stated are all my own.